This isn't the fetid pile of incorrectness that is the VRC7 vs the YM2413 as on the HFX4. I would still be really psyched to find out a way to come up with a schematic to connect those pins. It would make the Gimmick purchase worth it to me. Probably just need to buy a 3rd party cartridge slot after getting some help with the wiring schematic. Well, the YMZ294's inputs are /WR, /CS, A0, Vdd, SO, Gnd, φM, 4/6, /IC, an eight-bit data bus, and /TEST. only SO is an output; everything else is a power supply or logic input. The SS5B has a bunch more pins, but we can ignore all the digital outputs... tie SS PPU A10..A13 and SS PPU /RD high, connect data bus, SS R/W low (or to YMZ /WR) ... YMZ /CS to SS /ROMSEL, SS CPU A14 high, SS CPU A13 to YMZ A0, SS M2 to YMZ φM... No promises it'd work, 't's just an educated guess. I still need to do some work to characterize the 5B's audio amplifier response. While the behaviour of the chip matches the YM2149* perfectly, as far as I've tested it, the actual amplification is separate and unique to the 5B. In particular, I believe it has a hard clipping behaviour when the amplitude of the input signals gets loud enough. I doubt the TNS boards make any attempt to recreate this, from what I know about them. * The YMZ294 is just a reduced-pin variant of the YM2149, from what I understand. I've never worked with one directly. YMZ294 are available from ebay and aren't expensive, that's the easiest way to get 5B expansion audio working. I noticed that they're all from the same seller: utsource. And they're located in China. Have there been any instances of 'fake' YM sound chips? Hey thanks for your time, though I'm extremely hesitant about opening and accidentally damaging my Gimmick cart and I really don't want to modify it in any way. Do you think there might be some way to connect the YMZ socket to the game cartridge itself using a 3rd party cartridge connector? I looked at the bottom of the TNS board and there is a series of connections from each cartridge connector slot and YMZ/YM sockets originating from the TNS-HFC5. Pictured below, YMZ's pins 11-18 Data bus (D0-D7) are connected to their respective cartridge pins 37-43 (CPU D0-D7). -the cartridges also receive data from pins 2-15 (CPU A0-A11) and 32 (M2), and 33 (CPU A12) which the YMZ seems to have no involvement with. -YMZ pin 8 (Clock Select) has 2 small gold squares next to it with which it's connected to one visibly. There is a notation that reads "R2" which I'm guessing means it's a resistor? -The cartridges also receive 2a03 audio input (pin 45), and sends audio to RF (pin 46), which both have resistors that lead to the mixing board on the opposite side of the board. The YMZ has pin 5 Sound Out but it seems like there is no audio input (I guess cart pin 46 would connect to YMZ pin 5 ?) 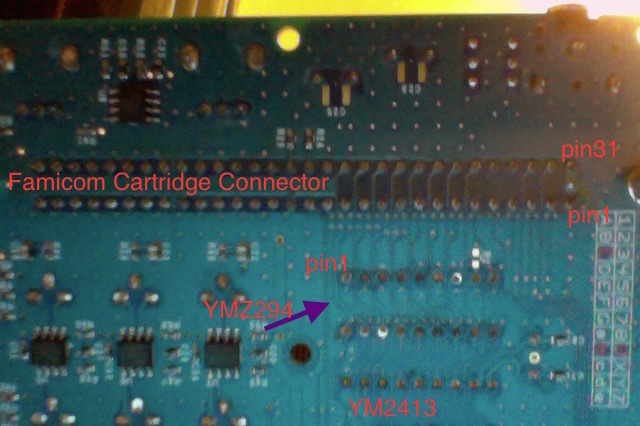 Also there is no visible connection between YMZ pin 5 and the mixing board from the bottom, but there may be on the top; everything up there is more ambiguous since I can't see the direct connection to the socket since the socket itself is hiding it from view. For that reason there are probably some connections I'm unaware of since I'm just going by visual common sense rather than actual electrical knowledge. the cartridges also receive data from pins 2-15 (CPU A0-A11) and 32 (M2), and 33 (CPU A12) which the YMZ seems to have no involvement with. Missing M2 is a little weird... the YMZ needs a clock source. What's YMZ294 pin 7 connected to? YMZ pin 8 (Clock Select) has 2 small gold squares next to it with which it's connected to one visibly. There is a notation that reads "R2" which I'm guessing means it's a resistor? The SS5B mixes the audio from the FC (ignored on the TNS cartridges, I think?) and then uses an on-die amplifier. The YMZ294 doesn't have this amplifier, but I'm not clear if you'll need it. For that reason there are probably some connections I'm unaware of since I'm just going by visual common sense rather than actual electrical knowledge. Using a continuity meter will help. If you don't have one (such as part of a multimeter) lying around, I've made a super-cheap one out of a AA battery, a pair of headphones, and a 10kΩ resistor—you'll hear a click any time you make or break contact. It's going to be hard to get you better instructions without having either the TNS schematic or good enough access/pictures to the hardware to recreate the relevant portion of the schematic. Overall, this seems to be outside my current level of capability. Thanks for your help tho! Maybe I'll look into copyNES, or I'll let you know if I ever find a non-Gimmick SS5B chip to work with. IF all the above are true, then I'm not clear why just plugging Gimmick! in isn't working. Well, not really, unless you install a CopyNES in a Famicom. You can mod an NES for expansion audio, but the mixing doesn't loop the 2A03 audio through the cartridge like the Famicom does, so you don't get exactly the same situation (5B is mixed separately by itself), though it can be very close. If the 2A03 audio signal is supposed to go through the 5B's amplifier, it could be a bit different. This is a bit unknown to me at the moment, I plan to do some discovery work on this later on this year. Well, not really, unless you install a CopyNES in a Famicom. I currently have an AV Famicom, but am not familiar with the similarities and differences between NES, Famicom, and AV Famicom to safely make the installation. If the 2A03 audio signal is supposed to go through the 5B's amplifier, it could be a bit different. This is a bit unknown to me at the moment, I plan to do some discovery work on this later on this year. No, my CopyNES is in my NES. Installing it means desoldering and removing the 2A03 CPU, replacing this with a socket, then sticking the CopyNES device in that socket, and then the CPU goes into a socket in the CopyNES device. The shape of the CopyNES board is designed to fit in an NES case. If you put it on a Famicom or a Top Loader, I think you'd basically have to build a new case to put them in. I dunno whether you could make a different CopyNES PCB that fits, but there's a lot less room in either of those. I see, would you then have to use a 60 to 72 pin converter to put Gimmick in? How did you get it to play back with Gimmick exactly? I know I would need to put a resistor somewhere to get the NES to playback expansion audio. I'll look it up after getting an NES. Okay, I think going down the NES path is probably most practical then.